London had the best freaks, always had. The Egyptian Hall, the Promenade of Wonders, the Siamese twins, pinheads, midgets, cannibals, giants, living skeletons, the fat, the hairy, the legless, the armless, the noseless, London had seen it all. In the Hall of Ugliness the competition was stiff. But noone had ever seen anything quite like Julia . . . Pronounced by the most eminent physician of the day to be "a true hybrid wherein the nature of woman presides over that of the brute," Julia Pastrana stood apart from the other carnival acts. She was fluent in English, French and Spanish, an accomplished musician with an exquisite singing voice, equally at ease riding horseback and turning pirouettes—but all anyone noticed was her utterly unusual face. Alternately vilified and celebrated, Julia toured through New Orleans, New York, London, Berlin, Vienna, and Moscow, often hobknobbing with high society as she made her fame and fortune. Beneath the flashy lights and thunderous applause lies a bright, compassionate young woman who only wants people to see beyond her hairy visage—and perhaps, the chance for love. When Julia visits a mysterious shaman in the back alleys of New Orleans, he gives her a potion and says that she'll find a man within the year. Sure enough, Julia soon meets Theodore Lent, a boyishly charming showman who catapults Julia onto the global stage. As they travel the world, the two fall into an easy intimacy, but the question of whether Theo truly cares for Julia or if his management is just a gentler form of exploitation lingers heavily with every kind word and soft embrace. 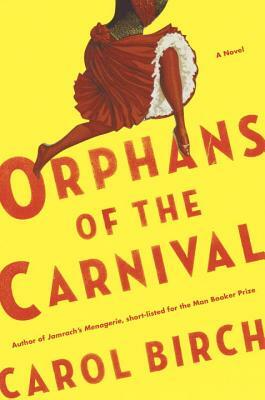 Stunningly written and deeply compelling, Orphans of the Carnival is a haunting examination of how we define ourselves and, ultimately, of what it means to be human. CAROL BIRCH is the author of eleven previous novels, including Turn Again Home, which was longlisted for the Man Booker Prize, and Jamrach's Menagerie, which was a Man Booker Prize finalist and longlisted for the Orange Prize for Fiction and the London Book Award. "If readers can resist looking Pastrana up on the internet before finishing the novel, they will be rewarded by the sort of bizarre twist that can happen only in real life. ...enjoyable and moving"
"Roll up, roll up, for a beautifully written novel about the poignant inner life of 19th-century touring freakshow attraction Julia Pastrana"
"A strange, transfixing novel....gorgeously written...Orphans of the Carnival is about how we can find humanity in all fellow creatures, which is surely a message worth pondering now more than ever."